54 Electronics Projects That Voyage Beyond Human Senses! Reach beyond the limits of your own eyes, ears, nose, and sense of touch with these 54 exciting projects that enlist the uncanny talents of electronic sensors to probe dimensions beyond mere human powers of perception. 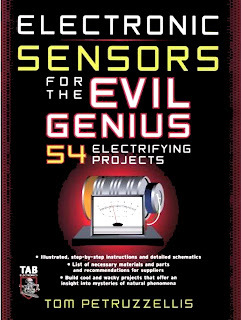 With the help of popular electronics author Tom Petruzzellis, you can build your own fantastic projects that measure, touch, and explore the limits of the known natural world and the leading edges of the future of science and robotics! All 54 projects are fun, easy, and inexpensive to make at home and -- best of all -- seriously exciting and impressive! 54 Proyectos de Electrónica Aquel viaje más allá de los sentidos humanos! Llegar más allá de los límites de sus propios ojos, los oídos, la nariz y el sentido del tacto con estos 54 proyectos interesantes que se alistan los talentos asombrosos de sensores electrónicos para sondear las dimensiones más allá de meras fuerzas humanas de la percepción. Con la ayuda de la electrónica popular del autor Petruzzellis Tom, usted puede construir sus propios proyectos fantásticos que la medida, el tacto, y explorar los límites del mundo natural conocida y los bordes del futuro de la ciencia y la robótica! Todos los 54 proyectos son divertidas, fáciles y de bajo costo para hacer en casa y - lo mejor de todo - en serio excitante e impresionante! Sound Energy. Sound Energy. Types of Microphones. Amplifying Sounds The Audio Amplifier. Electronic Stethoscope. Underwater Hydrophone. Ultrasonic Listener. Infrasonics. Light Detection and Measurement. Light Detection Devices. Listening to Light—Using an Opto-Listener. Measuring the Solar Constant— Using a Radiometer. A Basic Radiometer Circuit. Measuring Ultraviolet Rays— Using an Ultraviolet Radiometer. Measuring Ozone—Using an Ozone Meter. Sensitive Optical Tachometer. Turbidity. Heat Detection. Infrared Flame Sensor Switch Freezing Temperature Alarm Overtemperature Alarm Analog Data Logger System LCD Thermometer Night Scope Project Infrared Motion Detector. Liquid Sensing. Rain Detector. Fluid Sensor Humidity Monitor pH Meter. Stream Stage Water-Level Measurement. Gas Sensing. Air Pressure Switch Electronic Sniffer Bargraph Pressure Sensor Pellistor Combustible Gas Sensor Electronic Barometer. Vibration Sensing. Vibration Hour Meter Seismic Vibration Alarm Piezo Seismic Detector Research Seismograph AS-1 Specifications. Detecting Magnetic Fields. Historical Review. Transformer Action. The Radiation Field and the Induction Field. The Magnetic Field. The Electronic Field. Magnetic Detectors. The Rarkhausen Effect. Two-Inch Diameter Pickup Coil and Applications. ELF Monitor. Shielding. Electronic Compass. Sudden Ionospheric Disturbance Receiver. Earth Field Magnetometer. Toroidal-Core Flux-Gate Sensor The Flux-Gate Sensor Flux-Gate Magnetometer. Sensing Electric Fields. Electrostatic Fundamentals Building a Classic Electroscope Building a Leyden Jar Building a Static Tube Simple Electronic Electroscope Ion Detector. Atmospheric Electricity Monitor Advanced Electrometer Cloud Charge Monitor Electrical Field Disturbance Monitor. Radio Projects. Radio History. Detecting Lightening. Lightning Detector. ELF/VLF Radio or Nature's Radio. Shortwave Radio. Frequency Calibration. Jupiter Radio Telescope. The Jupiter Radio Telescope Antenna. Radiation Sensing. Space Radiation. Radiation Sources on Earth. Fun with a Cloud Chamber. Low-Cost Ion Chamber. Low-Cost Ion Chamber Radiation Detector. Advanced Ion Chamber Radiation Detector. Experimenting with a Geiger Counter. Appendix: Helpful Contact Information. Data Sheets.